Up until now, Billy Baggs’ life has been full of nevers. Never been to a movie. Never played baseball with a real team. Never got over feeling guilty for the loss of his brother, which forever shattered his Minnesota farm family. 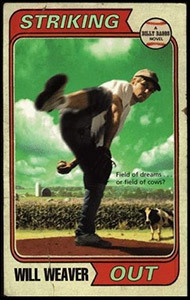 Urged on by the town’s baseball coach, Billy discovers he has talent–both on the field of his family’s farm and on the baseball field. This novel has hard-hitting realism and strong writing. The prologue, focused on a wrenching farm accident, has been used in high school speech contests. Striking Outincludes a couple of unfinished plot lines that Weaver finishes in two sequels. Among many awards, this novel was chosen as a 1993 American Bookseller Pick of the Lists and a 1994 American Library Association Best Book for Young Adults. “[C]omplex characters grow and change in profoundly real ways.”—Kirkus Reviews. Billy’s brother, Robert, would have been thirteen that summer. But here’s how it happened. The accident. Billy and Robert were home on the farm by themselves. Their parents were gone to town, the father for plow parts, their mother for groceries. A brief town trip. There was nothing unusual about this. On the farm, Robert was disking with the big tractor. It was spring. Spring was the shortest season in Minnesota. It was important to keep the tractor going. To put in the hours. Dawn to dark, dark to dawn. Fields did not get finished otherwise. This was my first young adult novel. If read closely you can see me struggling a bit to find the right style, tone, and voice for young readers. But it’s a serious look at one family struggling with a deep wound. Baseball is the hook, but the novel is really about how families work (or sometimes don’t).